I’m 55, and 6 weeks ago my wife Vicki and I began doing something we wish we had started doing 35 years ago. Maybe you are already doing this, or maybe my encouragement can help you get this right a lot sooner than we did. What did we begin doing? We started taking a real weekly sabbath. In the past I’ve applied some sabbath principles. I’ve taken a day off each week fairly consistently. I’ve also tried to take a couple of extra hours with God on Saturdays. But Vicki and I have never taken a full-on weekly sabbath where we kick back and do almost nothing. I’m not an Old Testament scholar, but I’ve taken a few Hebrew courses, and as far as I can tell the word “sabbath” (shabbat) means simply “stop!” So Vicki and I have started doing that, stopping as fully as we can one day a week. Here’s how it works. Our sabbath is Sundays around 6:00pm until about 6:00pm on Mondays. (We start Sunday evening because I teach a class Monday evenings so taking all day Monday isn’t an option.) On Sunday evening we chill or go to the monthly Holy Spirit Night at our church; on Monday morning we sleep in, have breakfast together, and we each take time with God. Monday afternoon we enjoy doing some relaxing and fun things together together like biking, walking or working on photo albums.What is taking a sabbath all about? I think it’s about connecting with God, others and ourselves. It’s about saying “no” to the crazy materialism, busyness, and self-importance that engulfs us. It means taking a day to really stop and by doing so to recognize that God is God and everything depends on him and not on our striving, our effort, our planning, and our worry. You might be thinking, “Wasn’t the sabbath part of the Old Testament law and wasn’t that all done away with by Christ?” It’s true that sabbath observance was part of the ten commandments and the law. But sabbath actually goes back much further than that, back to creation itself. Genesis chapter 1 tells us that sabbath is built into creation itself. And when questioned about breaking sabbath traditions, Jesus clarifies that the sabbath was made for our benefit (see Mark 2:27). When we ignore its principles we miss tremendous blessings. Accept sabbath as a gift. It’s not one more thing for you to add to your to-do list. It’s a gift to be cherished and embraced. Plan and prepare. In biblical times, the day before the sabbath was called “the day of preparation” because if you are going to take the day off there are always some things you need to take care of ahead of time. For example, I teach a Monday night class, but my sabbath comes immediately before it, so I need to get prepared for class before my sabbath begins. We also do certain food prep and some simple things like changing our guinea pig’s cage ahead of the sabbath. Disconnect to connect. Modern technology creates a crowded craziness in our lives. To get a real sabbath, turn off your distracting electronic gizmos and gadgets. Realize that no sabbath is perfect. Last Sunday night I helped teach small group leader training at one of our church’s emerging campuses (even Jesus healed on the sabbath). Some Mondays we take one or two of our small grandchildren. Grandparenting in that way keeps the sabbath a fun time to unwind and connect, though it is a bit less quiet and less relaxing. Is your life crazy? Do you need to connect with God, others and yourself at a deeper level? If so, stop! Get refreshed. Take a real sabbath. Try it; I think you’ll really like it. On sabbath: If you want to do some reading on life balance, two books to pick up are In Search of Balance, by Richard Swenson, and The Rest of God, by Mark Buchanan. Also, if you are in full-time pastoral ministry, we highly recommend the wonderful pastors retreat center called Cedarly that is on a lake west of Milwaukee. Vicki and I have retreated there three times over the past six years. 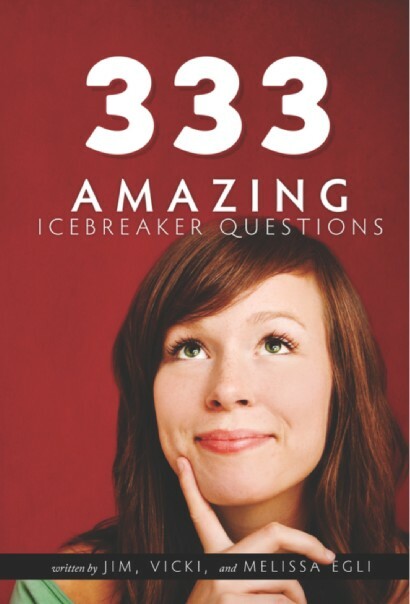 Great small group stuff: If you want to easily find the best icebreakers for your small group, I encourage you to bookmark my new small group icebreaker page. I’ve also got a lot of free downloadable small group resources up at this page. And, as always :-), if you want to read the most researched book on how to lead a vibrant group, grab my latest book Small Groups, Big Impact.